Anyone in need of a fencing, concreting or landscaping service in the Werribee or Werribee South area should look not further than Everlast Services. We’re a family owned business that has been providing a quality service in the area for 20 years, we love our community and we care about our customers. We have our own steel fabrication plant, allowing us to fabricate a lot of our own products – cutting out the middleman and allowing us to pass on the savings to you. We are 100% committed to only sourcing Australian owned and made products, so a decision to go with us is a decision to support the local economy. Every member of our team from the reception to the head office shares the same enthusiasm for delivering the perfect solution every time and for building a relationship with out customers. We genuinely care about you and for what you’re trying to achieve. Aluminium Slat Fencing: Just a quick hose down and slat fencing will look as sleek and fresh as the day we installed it. Steel Fencing: You can rely on steel, so go with what you can rely on. Swimming Pool Fencing: Fences that look good and keep the family safe. Industrial Security Fencing: We’ll help you to protect your most important asset. Colorbond Fencing: We love Colorbond and you’ll love what we can do with it. Driveway Gates and Fences: The service doesn’t stop at the fence, we’ll take care of the gate too – sliding, swinging, automatic – whatever you need, we’ve got the answer. Fencing Supplies: All made in our factory and we’re prepared to stake our reputation on the quality of what we produce. Aluminium Fence Panels: We fabricate the panels so you can do the job your way. Concrete Driveways: There’s an art to pouring a driveway and we’ve mastered it so you can be sure that it will last. Exposed Aggregate Concrete: Looks beautiful, lasts forever and requires little maintenance – what else could you ask for? Painted Concrete: Share your ideas with us and chances are, we’ll be able to use our painted concrete expertise to create it. Landscaping Design: We’ll make your backyard shine and unlock it’s hidden potential. 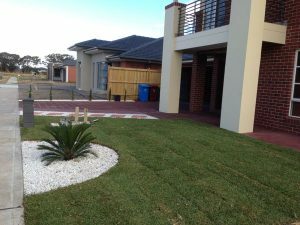 Landscaping Installation: We can build everything we design or assist you in actualising your vision. Landscape Supplies: Whatever you need, we’ll have it and the prices will keep you coming back. Timber Decking: No backyard is complete without a decking, if you want the best contact us. Pergolas: Our steel frame pergolas will stand u under anything and provide you with years of enjoyment.